You may prefer the crisp clean lines of concrete when it comes to your patio. The great thing about concrete is its durability and versatility. 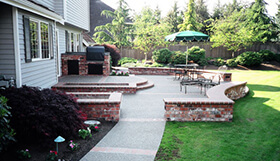 High quality concrete material provides durable and long-lasting patios. For example, we use over four inches of concrete in our patio installations to extend the life of your investment. We build patios into their natural surroundings, so the construction blends with the site and nature’s intent.